A girl places flowers on the graves of some of the victims who died during the political turmoil of 1998 during a 20th anniversary commemoration at Pondok Ranggon mass grave in Jakarta, Indonesia, May 13, 2018. Indonesia won its independence from Dutch rule in 1945, but it became a true democracy in May 1998, when military dictator Suharto stepped down after 33 years in power. This month marks 20 years since Reformasi (Reformation), the tumultuous end of his dictatorship, and two decades into their democratic experiment, many Indonesian activists are reflecting on the promises, both kept and broken, of that era. FILE - A statue of former Indonesian president Suharto is pictured at the Suharto museum in Yogyakarta, March 29, 2014. President Suharto, an army general who seized power in 1965 after military-led mass killings of up to one million suspected communists, leftists, intellectuals, and minorities, ruled Indonesia with an iron fist for three decades. 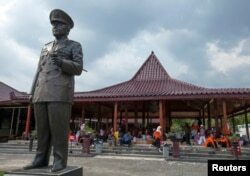 He centralized and modernized the Indonesian state by several degrees but crushed civil liberties and personally enriched his family to the tune of up to $35 billion, a culture of graft that still plagues Indonesia today. Suharto stepped down on May 21, 1998 after extensive student protests, riots, targeted killings of Chinese Indonesians, and pressure from Western countries over human rights abuses in East Timor. FILE - Hutomo Mandala Putra, popularly known as "Tommy", top row third from left, youngest son of former Indonesian President Suharto, bottom row third left, is pictured in this undated family photo in Jakarta, Indonesia. After 1998, newfound freedom of speech encouraged an independent media but also amplified intolerant voices, particularly from hardline Islamists, who found their ideas had more channels and more listeners than ever. It is no coincidence that the group called the Islamic Defenders Front was founded in 1998 and the sharia-promoting Indonesian Mujahideen Council formed in 2000. Richard Oh, an Indonesian novelist and filmmaker, lived in the majority-Chinese neighborhood of Pluit, in North Jakarta, in May 1998, and recalled the atmosphere there. Oh, who later fictionalized these events in two novels, The Pathfinders of Love and The Heart of the Night, said it is not as simple as saying that there was no freedom of expression under Suharto and total freedom in the democratic era. But Andreas Harsono, a Human Rights Watch researcher who used to be a reporter and founded Indonesia’s Alliance of Independent Journalists, said that while media freedom is not perfect, it has certainly improved since Reformasi. “These are the challenges in which the ’99 Reformasi movement has not succeeded: to abolish discriminatory regulation and state institutions, including the Ministry of Religious Affairs,” said Harsono. 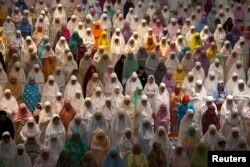 Muslim women attend prayers at the first day of the holy fasting month of Ramadan at Al-Akbar Mosque, Surabaya, East Java, Indonesia, May 16, 2018. Indonesia is the world’s largest Muslim-majority country, but its tolerant version of Islam has gradually ceded ground to hardline groups who set the political agenda, from the rise of sharia-inspired bylaws to influencing the contentious Jakarta election of 2017, when the incumbent Christian governor was imprisoned for so-called blasphemy against Islam. Moreover, even twenty years after Reformasi, many human rights abuses in Indonesia’s recent past go unaddressed. It is still impossible to discuss the mass killings of 1965-66 that paved the way for Suharto. 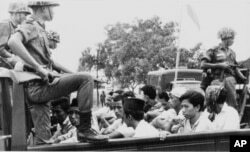 FILE - Members of the Youth Wing of the Indonesian Communist Party are guarded by soldiers as they are taken by an open truck to prison in Jakarta after they were rounded up by the army following a crackdown on communists after an attempted coup, Oct. 30, 1965. Even current President Joko “Jokowi” Widodo, the first non-military president in Indonesia, has fallen short on human rights according to Maria Sumarsih, who runs the weekly Kamisan human rights protest in Jakarta. 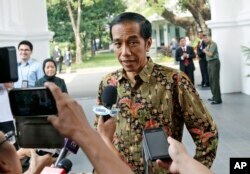 FILE - Indonesian President Joko Widodo, center, talks to the media at Merdeka Palace in Jakarta, Indonesia, Oct. 21, 2014. Twenty years into that new era, Indonesia is not without its issues. But it is the world’s third-largest democracy today, and has proven itself remarkably resilient. The long campaign against corruption, which has continued to plague the country, saw its first big breakthrough in April, when the former speaker of the Indonesian legislature, Setya Novanto, was sentenced to 15 years in jail for embezzlement, after a long pursuit by officials. FILE - Policeman guards as former Indonesian parliament speaker Setya Novanto (C) attends court for his verdict in Jakarta, Indonesia, April 24, 2018. Novanto is one of the highest profile Indonesian politicians to ever be successfully prosecuted for graft. The case has been seen widely as a turning point in the country’s efforts to tackle graft. “The recent decision against [him] is really a new milestone for anti-corruption efforts in Indonesia,” said Adnan Topan Husodo of Indonesia Corruption Watch, at the time of the verdict.